Malibu is suffering the same fate as San Diego. 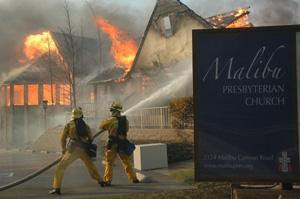 Modest homes, mansions and churches have not been spared. Governor Schwarzenegger declared a state of emergency throughout seven counties in Southern California on Sunday. Sometimes you have to wonder if the fires were not intentionally started by arsonists. Whenever the Santa Ana winds start blowing, fires seem to be the order of the day. California, at least in northern California where I live, has a lot more rain this year than it did this time of the year last year or in previous years. Whatever dampness that was present in the areas is as good as dry tinder, the way the fires are going. If indeed the fires were caused by arson, and if any of these arsonists is caught, he or she should be put away for life. A pyromaniac like that should never be left to run around because he will do his evil deed again and again. Nature herself is the source of many fires, she does not need Man to help her. I am sorry that many have lost their homes in these fires. I think it is terrible to lose everything you own. Yes, homes may be rebuilt, and possessions may be accumulated again, still it is traumatic to lose every earthly possession you've got. I will have to re-assure my parents back in Malaysia that the fires are no where near where we live. Every time there's a tornado, a flood, or a fire, they get anxious. My friends are moving to LA in a month and this is certainly not a good news for them. Hopefully this can be over soon. I think by next month everything should be better. It'll be much cooler then and hopefully there'll be more rain. Ya, its kind of like a yearly thing. But most time it burn by itself...but if it was done by arsonist...get the person and punish him/her with full force. U r right, houses can be rebuild and things be bought, but somethings cannot be bought...like memories, photos, family treasures...those kind of things...no money in the world can replace those items. Yes, it has become a yearly thing. Like the hazy season in Malaysia! Heheh. People in Southern California had to wear face masks just like we did in Malaysia during the height of the haze season.